233 Alice Harris Road in Prosperity, SC is an absolutely adorable cottage on Lake Murray, SC. Newberry Hospital is 17 miles away. For air travel, Columbia Metropolitan Airport is less than 1 hour away; Greenville-Spartanburg is 1.5 hours away; and Charlotte is 2 hrs away. By land, it is only five miles from the soon-to-open Fiddler Blues lakeside restaurant next to TB’s Club and seven miles to Big Man’s Marina, known for the best hamburgers on Lake Murray. 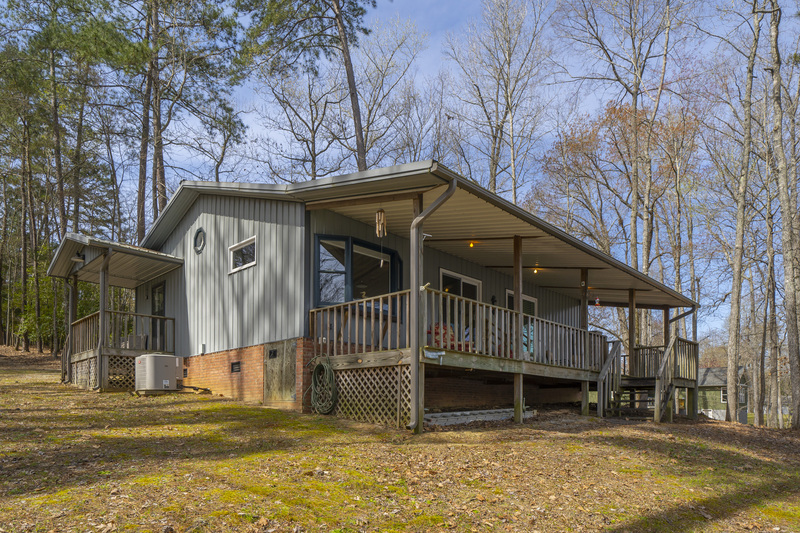 This property is a sturdy steel structure with 1200 square feet, 2 bedrooms and 1 bath and metal roof that sits on a .65 ac slice of heaven. Enter the home either from the side porch next the parking pad or from the lakeside, where there is a covered porch that is the full width of the dwelling. Inside, there are high vaulted ceilings with exposed beams and all new energy efficient windows and doors. The open floor plan is perfect for entertaining or sprawling out to enjoy a peaceful getaway. 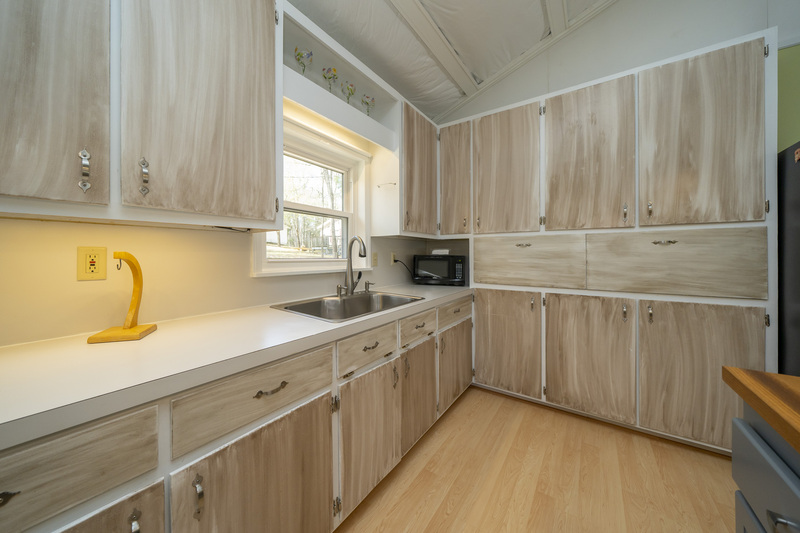 The kitchen has lots of cabinets, pull-out drawers, and counter space. The island, with butcher block top and slide-in, smooth surface range also serves as a bar. It was new in 2016. The sink and faucet were replaced in 2013. The refrigerator was new in 2018. The window seat in the big room is the perfect spot for curling up with a good book or simply enjoying looking at nature. There is a lovely 3- candle wall unit that converts to a wall fireplace using Real Flame Gel Fireplace fuel, with each canister producing 3000 BTU of heat. The central heating and air conditioning unit was new in 2011 and the compressor was replaced in 2014. Additional insulation was added to the vaulted ceilings throughout. Additionally, Armstrong ceiling planks were used in the master bedroom. These measures were taken to increase energy efficiency and to enhance acoustics. The house has laminate floors in the main area, tile in the bath, and carpet in the bedrooms. There are ceiling fans in all living and sleeping areas. The bathroom has a large walk-in shower and doubles as the laundry room. The sloping driveway, while a bit bumpy, is designed to carry rainwater away from the dwelling and it does so effectively. The structure is equipped with leaf-guard gutters front and back. Further, a vapor barrier and automatic vents were installed in 2013. There is a storage building for yard equipment and lake toys. This property has a floating dock and jet ski dock in place. Hawleak Creek runs directly in front of the property; therefore, there is deep water at the end of the dock. 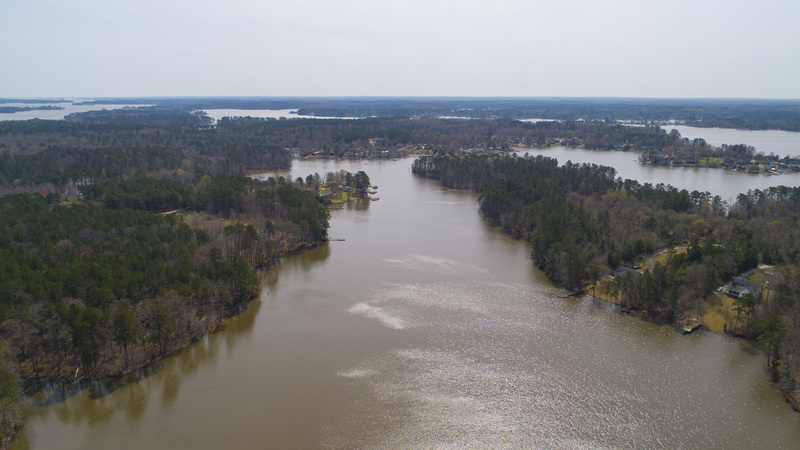 When Lake Murray was drawn down ten feet in the winter of 2018-2019, there was water at the end of the dock and always excellent fishing. This home comes with a 12 month home warranty and an Econobug transferable lifetime repair termite bond with $175/yr annual renewal. SCE&amp;G provides electricity. There is a septic tank that was pumped out in 2014 when the pump was replaced. Newberry County Water and Sewer Authority provides the water to the property. The sellers say it is the best public water they have ever tasted! 233 Alice Harris Rd is located in Newberry County and zoned for Little Mountain Elementary, Mid-Carolina Middle School, and Mid-Carolina High School. 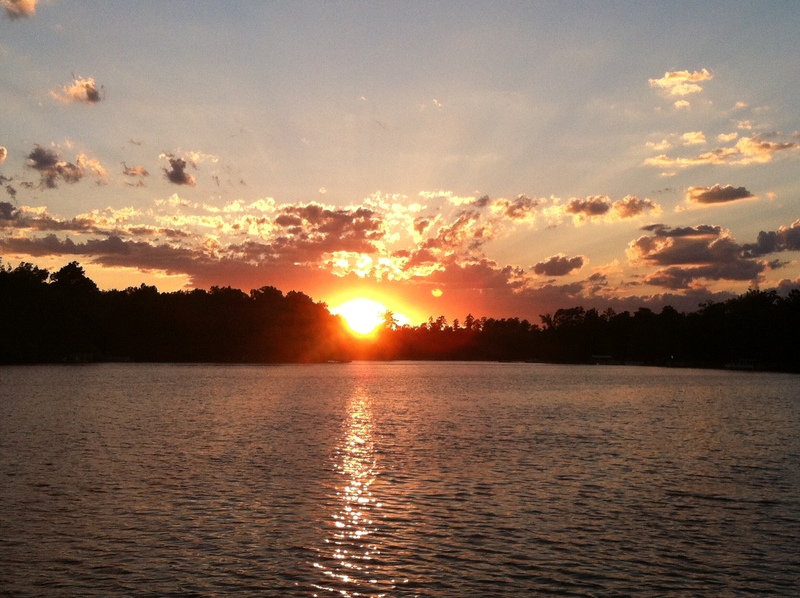 Lake Murray is an approximately 50,000 acre recreational lake with over 600 miles of shoreline. Lake Murray offers pristine locations for kayaking, canoeing, boating, fishing, and skiing. 233 Alice Harris Rd, Prosperity is no exception. Along the meandering shoreline of Lake Murray, there are areas for hiking, camping, biking, and there are picnic areas. Several municipal and corporate parks either touch on the shores of the lake or are nearby, and they often times offer organized activities and educational opportunities for all ages.Golfers enjoy the challenging fairways and beautiful greens at Timberlake Country Club, the only golf course ON Lake Murray, located just 18 miles away from 233 Alice Harris Rd, Prosperity. Bring your fishing gear and a change of clothes and call 233 Alice Harris your Lake Murray home sweet home.